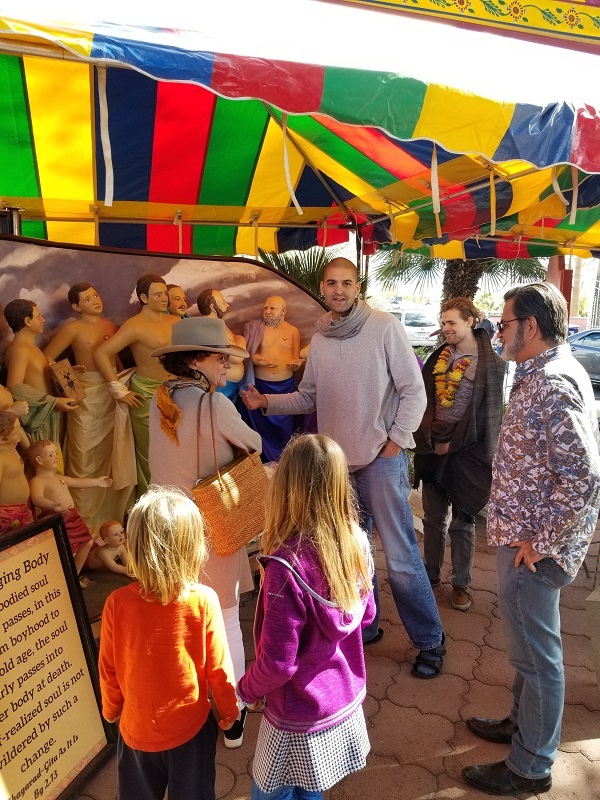 Tucson Temple was special treat, as it reminds us of the early 1970s--a small family type atmosphere where all the devotees participate in the full morning program. Govinda's Restuarant, right on the temple campus, insures that lots of people are coming every day. 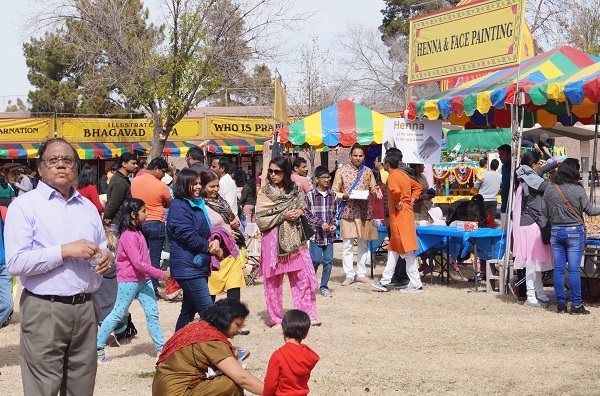 On February 17th--Nityananda Prabhu's appearance Day, Festival of India's exhibits were there. Above, the view of Govinda's and the temple from the parking lot. 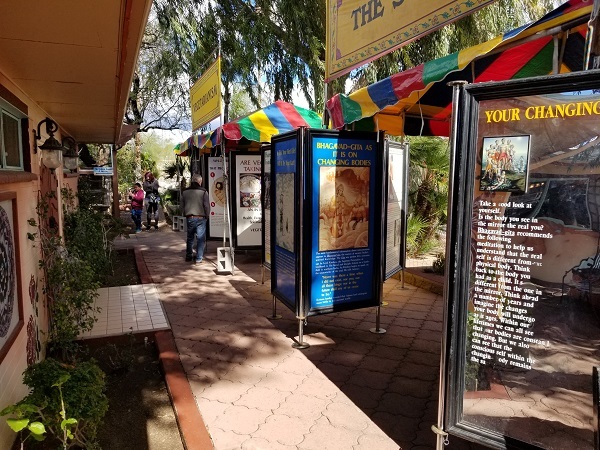 FOI's exhibits on the walkway to the temple's front door. 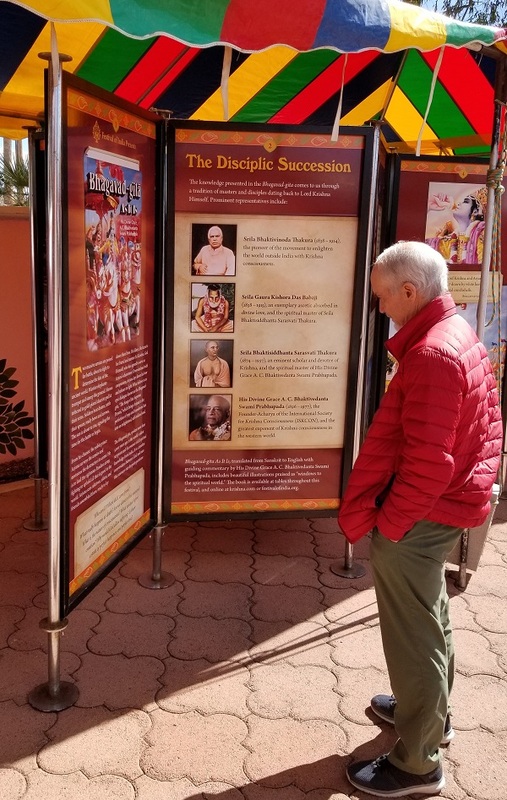 One of Govindas' guests studying Festival of India's newly repaired Bhagavad-Gita exhibit. 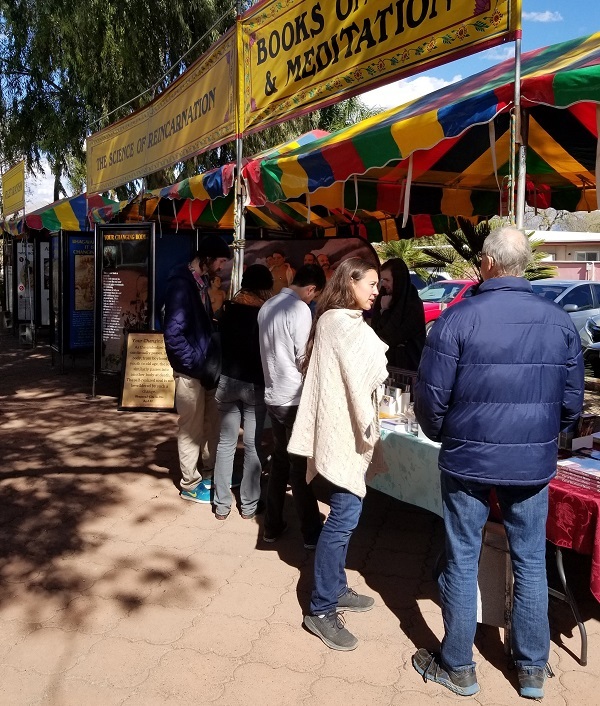 Gosh Thakor Prabhu (on the far right) speaking to guests at the Book table. After a festival the crew needs to get 'our batteries charged', a long hike/japa walk in a park works well. 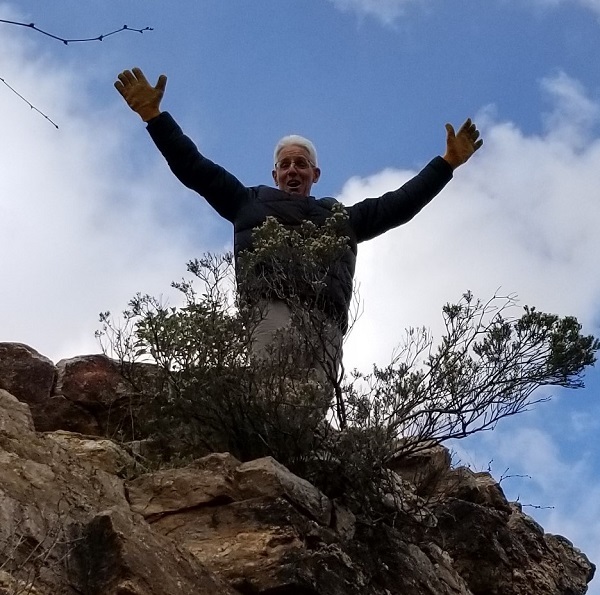 Bana Bhatta Prabhu blissfully chanting Japa on our morning walk in a scenic National Park near the Tucson Temple. Above, Lord Jagannatha, Lord Baladeva, and Lady Subhadra in Their Pheonix Temple. Above, Lord Jagannatha, Lord Baladeva, and Lady Subhadra on Their Chariot in the Pheonix Ratha-Yatra Parade. 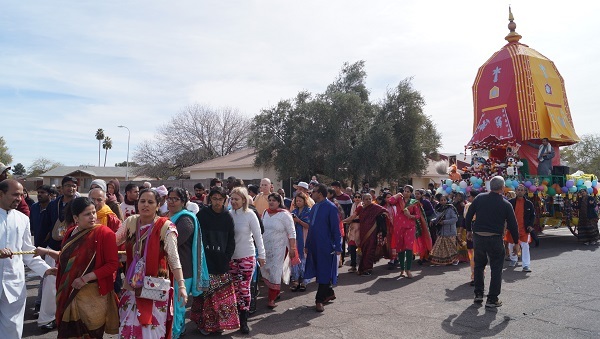 The Pheonix 2019 Ratha-Yatra Parade starting. 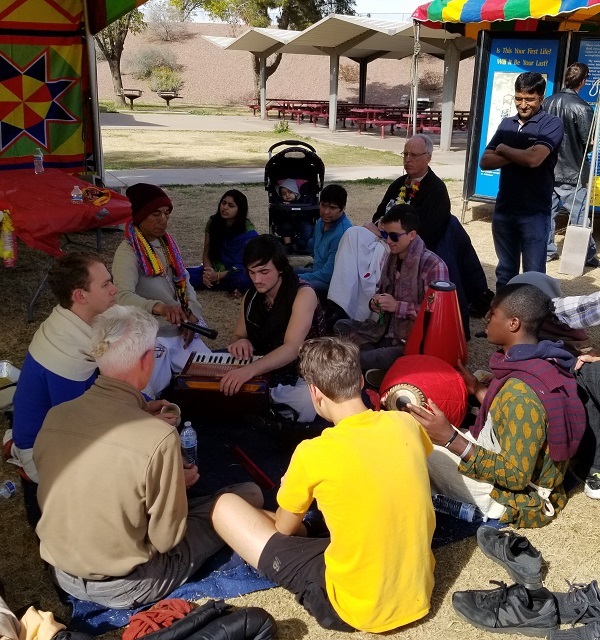 Rakta Prabhu, from Laguna Beach, came to be on the FOI crew for the Pheonix festival, leading the kirtan. 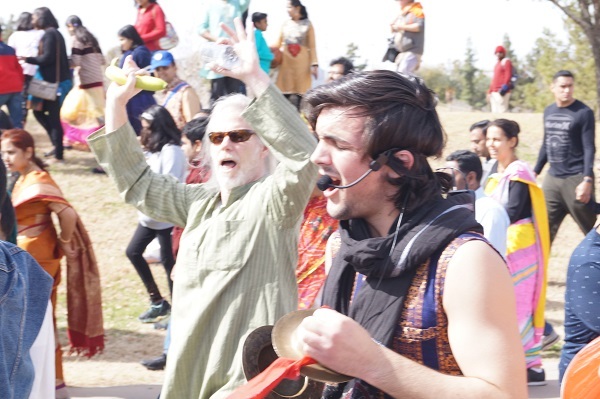 Sakshi Prabhu from Dallas, and Rakta Prabhu in the Ratha-Yatra Kirtan. Festival site Chariot and the buider--Ratna Bhusana Prabhu on the right. Some of the FOI crew. 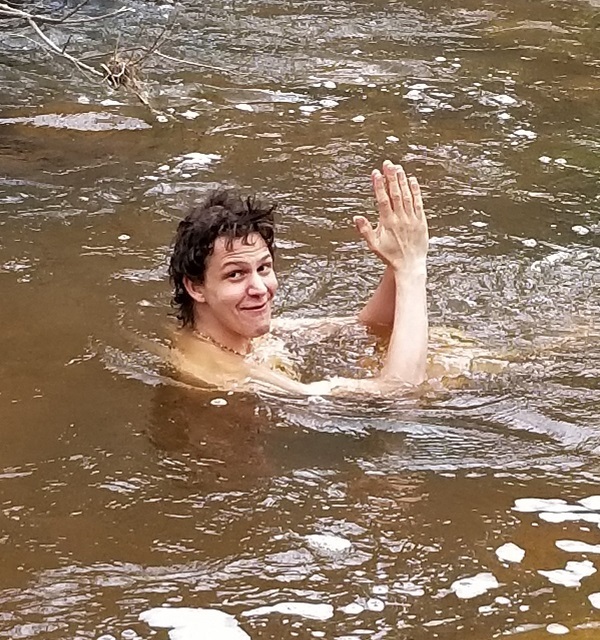 After honoring Krishna Prasadam, Yoga in bliss. 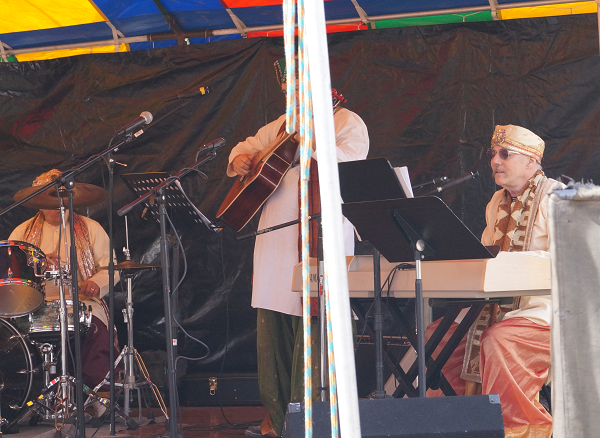 Deva Deva Prabhu (on the far right) and his Pheonix Kirtan Troupe. 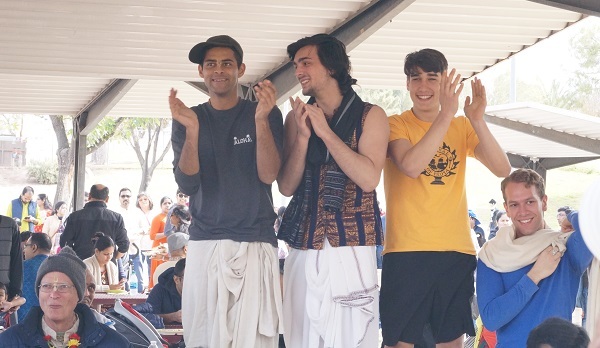 FOI crew chanting Hare Krishna in Lord Jagannatha's altar tent. 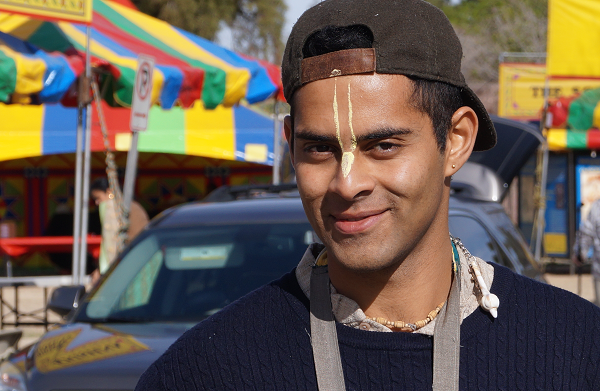 Chanting Dancing and Feasting on Krishna Prasadam--Bhakta Cory was in Bliss. 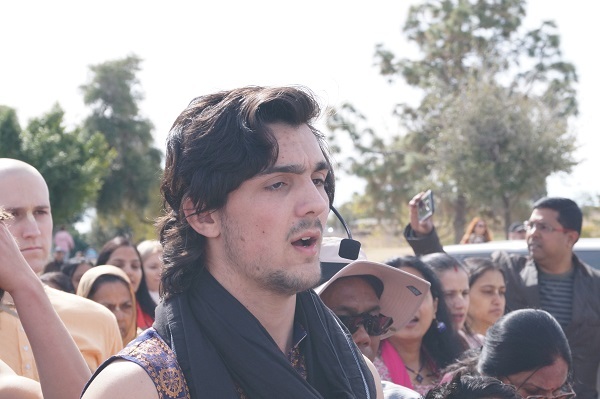 Deva Deva Prabhu and Pheonix Hare Krishna youth performed a wonderful Jagannatha Astakam on the main stage. 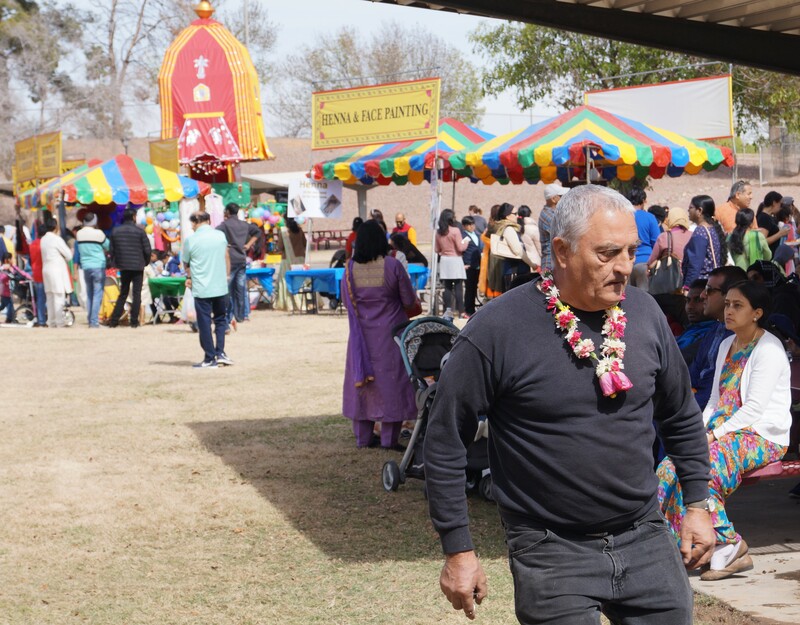 Even though it was much colder than usual February weather, this second annual Ratha-Yatra in Pheonix was well attended. 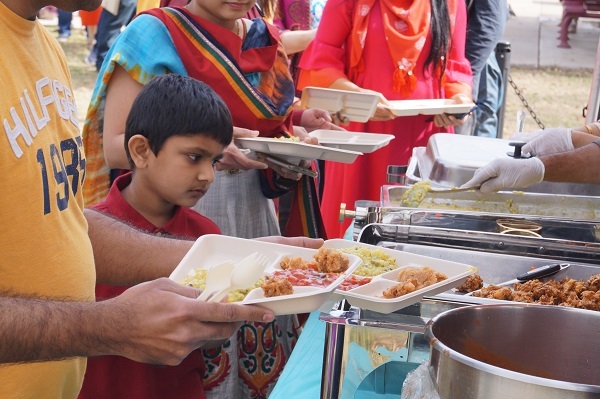 Everyone loved the Krishna Prasadam. 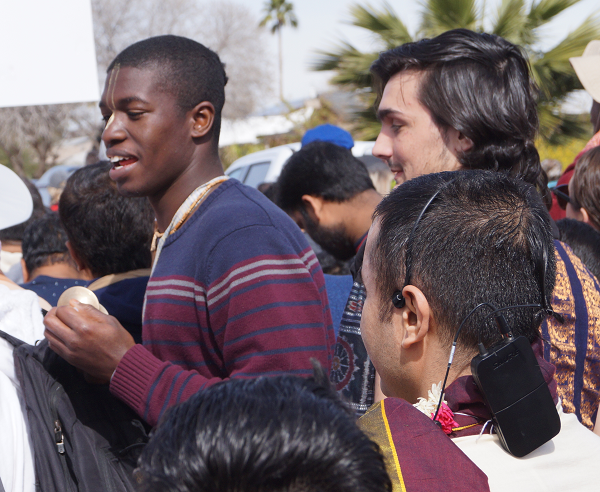 We look forward to going back to Pheonix next year and watch this festival grow and grow every year. 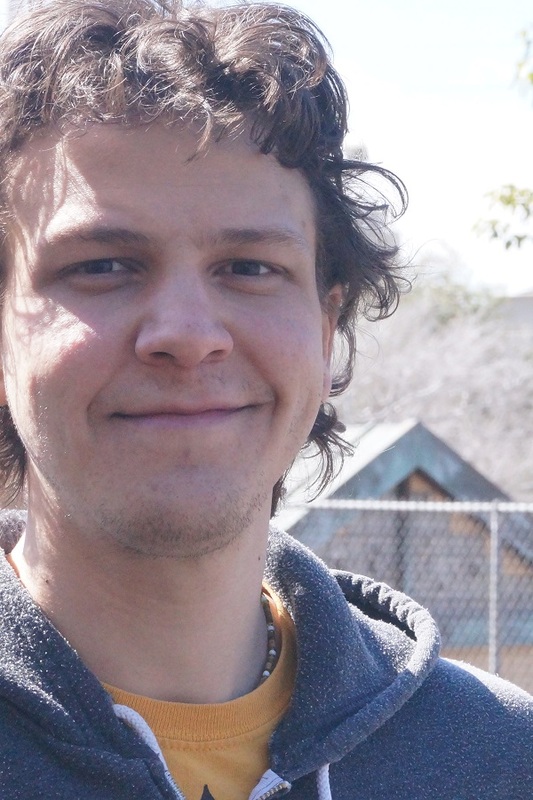 Thank you Badrinarayan Tulsiram for the Photos.